Antonio Tempesta, best known as a prolific printmaker, also specialized in oil paintings on unusual stone supports. 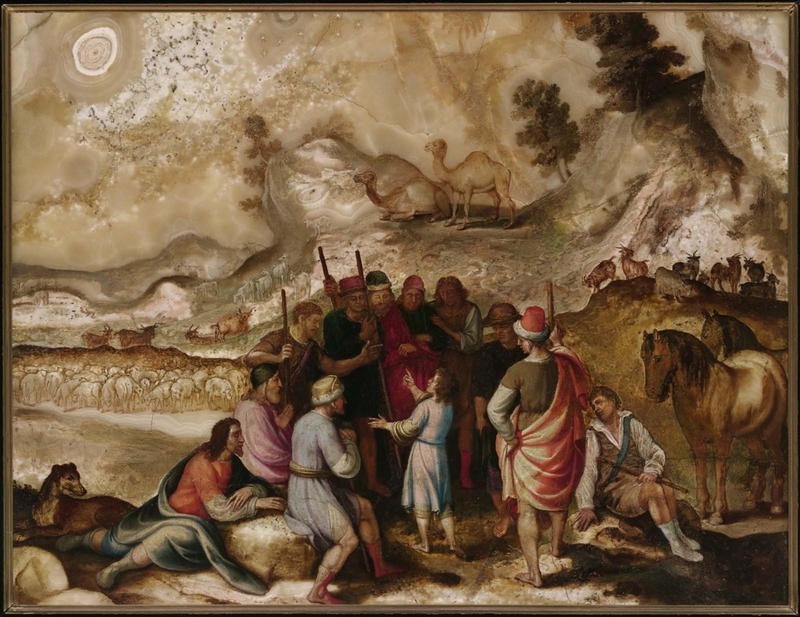 Here he presents a story from the Old Testament: Joseph recounts to his eleven brothers a dream in which the sun, moon, and eleven stars bowed down to him. The heavenly bodies were prophetic symbols of the power he would come to hold as ruler of Egypt. Joseph gestures up to a sun formed by the natural rings of the stone at the upper left. Tempesta transformed the veining of the alabaster into a rolling, restless landscape dotted with flocks of sheep, goats, and camels. That this painting and its companion (MFA accession no. 2012.120) had belonged to Tupper and were purchased in 1898 from Ichenhauser is according to a label on the reverse of the painting. When they were auctioned in 1991 they were said in the catalogue to come from the estate of William van Horne. The majority of the van Horne collection remained intact and in Montreal until at least 1946.